Mommy Cate and Carmen made "Thanksgiving" dinner yesterday. Mommy Claire couldn't really do much because she still is getting over that dog attack. Some dog called a SURGEON attacked her chest. Her booboo still looks pretty rough. Anyway, Mommy Cate didn't go to work yesterday, which was awesome just on its own, but then they started cooking all these GREAT smells. I was pretty sad when the three of them started eating all that wonderful food because we'd just had kibble for lunch. Sabre and Echo kept telling me to wait for it. They said they'd had lots of Thanksgivings, and that the pack leaders always made them a plate of food after they were done. I was pretty excited, and sure enough, Carmen and Mommy Cate made us all a plate of everything! I had turkey, gravy, potatoes, carrots and a little bit of something called a roll. It was SOOOO good I licked my plate over and over. Then, for normal dinner, we got a little kibble with a little bit more of all that great stuff! Man, I love this Thanksgiving thing. I'm a pretty lucky puppy! This is really fun to stick your tongue in. Carmie was sleeping yesterday and I stuck my tongue in her nose as far as I could! I got it almost all the way in. She yelped and said I hit her brain! Hahahahahaha. Carmen is SO funny. I'm gonna try it again today when she isn't expecting it. Oh yeah, and I'm 21 pounds now!!! Husky power!! So get this, Sunday night Carmen left and Mommy Claire went to sleep early so Mommy Cate headed down to the FUN PLACE. She calls it her studio. I don't know what that means, but she says she's still not unpacked yet. That means there are lots of boxes and stuff leaning against the wall to play obstacle course with. There's a door that opens to the backyard, and she leaves it open while she does something she calls metalsmithing. I love running around the whole room and hiding behind a box so Mommy Cate says "DIEF!! Where are you?" Then I bolt and run the rest of the room and shoot out the door before she can catch me. It's really fun when she has the fire thing in her hand, cause she gets REALLY annoyed. Well, I guess she must have gotten tired of me doing that because she put a HUSKY TRAP in the room!!! I snuck behind the door, where this sticky thing was on the floor. Mommy Cate SAYS she forgot it was there and the old people that lived here had wanted to relocate a mouse. I don't know what a mouse is, but I know it was to trap me! Anyway, I snuck back in to her studio and made sure she was working on something with her magic fire tool so she was distracted. I decided I wanted to start my run behind the door, so I snuck back there. But then this husky trap grabbed my back foot! I cried and ran and ran so fast. I ran behind all the boxes, trying to get away. Stuff was falling down all around me as I tore through the room. I saw Mommy Cate shut off her fire and yell "DIEF!!!! STOP DESTROYING EVERYTHING! ", but all I could do was keep running, trying to get away from the thing grabbing my foot!! I ran into the clear area of the room where Mommy Claire's picture taking stuff is going to be. Mommy Cate saw me running and saw me looking at my foot! I broke for the door, but Mommy Cate grabbed me up. 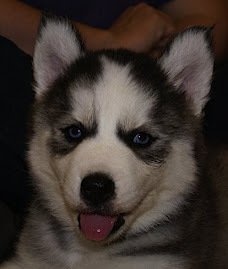 The husky trap still had me, so I had to wriggle and wriggle and try to get away. Mommy Cate was telling me to calm down! Calm DOWN? 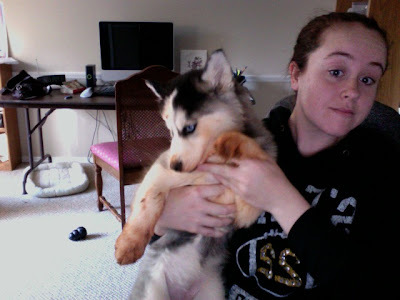 I had a husky trap on my foot!! That must mean she was in on it! I fought even harder to get away, but somehow she carried me up the stairs and opened the sliding door to get in the house. The husky trap STILL had me and Mommy Cate was LAUGHING! She opened the pantry door and got OIL! I've seen her use that when she cooks stuff! I thought "Oh no, she's going to EAT ME!!!!" so I fought even harder still, since she only had me with one arm. Somehow she still wrestled me into the kitchen sink. She held me with one arm while she opened the oil, and then she started to pour it on my trapped foot. That was the last straw. I knew she had fattened me up enough and was going to have me for dinner. So, I flipped myself over in the sink but she got me anyway - cooking oil all over my back and tail instead! She was laughing and telling me I was a crazy animal, and to be still already! Like I should just let her cook me? I don't think so. She started to put oil on my paw and got the husky trap off. Then she ran warm water and started to WASH me! I knew the pot couldn't be far behind, so I started trying to jump out of her arms while she was rubbing the oil in. 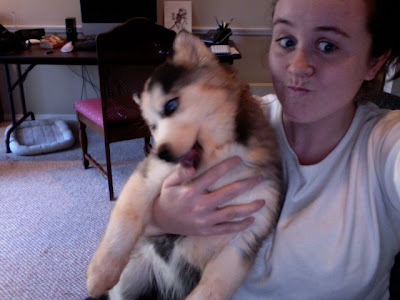 She grabbed me and muttered something about "crazy husky." You'll never guess what she tried to do next! She took me to the drowning place! Of course, that makes sense. It's easier to cook me if I'm drowned, right? So I fought all the way up the stairs. Mommy put me in the drowning place and spent about 15 minutes trying to prep me for dinner! She put this soap on me (I think it's like salt or pepper or something) and was rubbing it all over me. I fought SO hard. She was saying her back was starting to hurt and would I please calm down. In the end she gave up trying to drown me, and grabbed a towel. After she towel dried me off, she just sat down and started laughing at me. The good news was she didn't eat me after all. But I have to watch her now. I gave her dirty looks all night to let her know that I was on to her. Well, the next morning, she feeds me and is all nice and sweet. Then she takes me to the truck and puts me in the crate! She never does that. She normally feeds us and goes to work. She didn't take my brothers, just ME. I yelled for help the whole time in the truck but we didn't pass any police officers. We finally got to the place where she took me in and started talking about me being there for doggie daycare. I don't know what that means, but she left me! Anyway, all day long I was miserable. The people there weighed me, stole my poop and looked at it (I wasn't done with it yet either! ), and then a big mosquito bit me. The people at my new home really liked me, but I was so sad. They said I was super smart, because I know sit, down, come and stay already. I didn't eat all my lunch or dinner because I was missing everyone, and wondering what I did that made Mommy Cate try to cook me and then sell me. But then she finally came back! Oh, I was so happy! So I got back home last night and Carmen was back! YAY! Sabre and Echo were still there. Carmen told Mommy Cate that Sabre was on "hunger strike," but as soon as Carmen gave me some food Sabre ate all his. My brothers and I played really hard for 3 hours before we finally went to sleep. So I'm okay now, and home with Carmen. If anyone could please tell Mommy Cate that it's not nice to trap huskies, I'd appreciate it. Okay, I tried again! This time I think I have more of the effect I was looking for in my quest to look like my brothers (red and black german shepherds). I learned that if you ROLL in the red clay you loosened up, you get a much better look. I gotta go call the humane society to save me from the drowning place now before Carmen gets back! So Mommy Cate is back at work and now Carmen (my sis) is taking care of Mommy Claire all by herself while she gets better. Mommy Claire looks like she got in a bad fight. She's got a big boo-boo from her collar area to her tummy. So I'm not allowed to really play with her and all of us have to sit nice and let Mommy Claire pet us one by one. So, this morning Carmie put me outside while she did stuff with Mommy Claire. Well, my brothers always tease me cause I look different. They say I'm the white headed stepchild of the family. So I looked at the red clay in the yard and thought, "AHA! I can make myself RED like them!" I did pretty good, got almost half myself their color, and dug a really cool deep hole while I was at it. Then Carmen saw me and yelled. Next thing I know I'm being hauled up and she took a picture of me before taking me to the drowning spot. She calls it a bathtub, but I know what water does. It drowns huskies! Luckily I fought really hard and I'm strong enough now to not be drowned. However, she took my red off!!! If anyone knows how to make the red stay on without the drowning spot removing it, please email me. I can't find Mommy Claire. Mommy Cate and my sister Carmen keep coming to the house to feed us and let us play for a little while, then going back to someplace called a hospital icu. I'm really sad. I don't really like eating right now, because I think we should be out looking for her. Echo and Sabre told me they can track her. They used to do that for a job. But they can't get out of the house and yard to do it. Echo keeps trying. Mommy Claire always stays home with us, while Mommy Cate goes to work every day. We don't know what to do without her. Echo is so sad. He's Mommy Claire's special boy, like Sabre is Mommy Cate's. Echo keeps sleeping at the top of the stairs, where he can see Mommy Claire's bedroom and watch the front door, just in case she appears. Sabre won't eat unless Mommy Cate is home. Nobody really feels like playing. Mommy Claire left for the hospital Friday morning at 5 to get a tumor removed, but she's still not back. Mommy Cate said she's doing okay, but we won't see her for a few more days still. Happy 75thday Birthday to me! I'm 75 and 16 pounds!! Whoo hoo! I think I get cake. I should get cake. Or be allowed to chew on the chair or something. I like digging. Red clay is fun. I look awesome with red hair like my mommies. I hate baths. Gotta run! I know I must have presents SOMEWHERE.